Chrichton's World: Review Operation Mekong a.k.a. Mei Gong he xing dong (2016): I'll be damned. Dante Lam actually made one I loved! 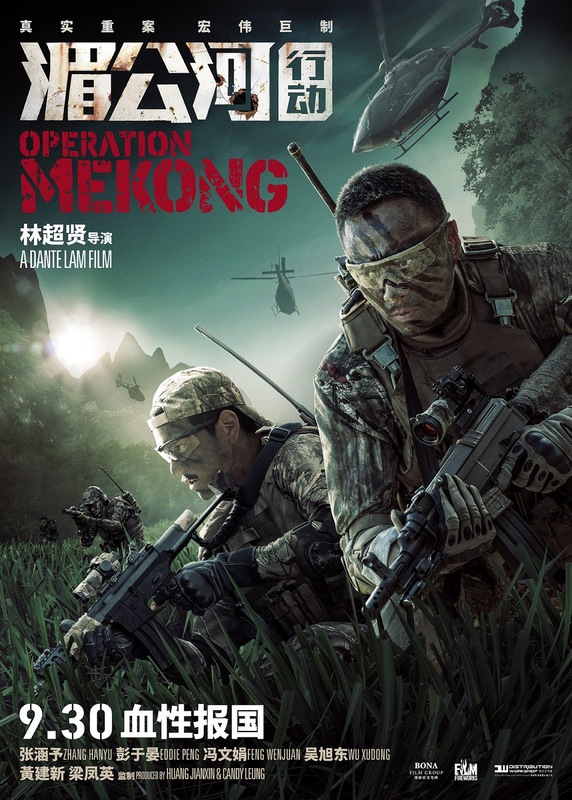 Review Operation Mekong a.k.a. Mei Gong he xing dong (2016): I'll be damned. Dante Lam actually made one I loved! Let me be totally honest here. I am not a big fan of Dante Lam. I don't think he is the worst director or even bad. I just fail to see how he is any kinds of brilliant. While I still think the latter I do have to admit that he has improved himself somewhat. So much so that I found myself enjoying Operation Mekong from start to finish. That being said this is the kind of movie that is hard to screw up. It's not like it has a lot of story or depth to it. In essence you are witness to a military or espionage operation where a lot of focus is put on the tension and the action. And in that department Dante Lam has managed to create some genuine thrills. Although I do have to point out that Lam's take on military operations is unrealistic and incredibly fantastical. But that is exactly what makes it so awesome. You have characters including a dog doing impossible things. It's what makes it super fun and incredibly exciting. Especially regarding Bingo the dog who goes full Sam Fisher (stealth) one minute and full Rambo the next. And most astonishing is the fact that Bingo is an equal in every way. For that alone this film deserves credit. The villains are a little cartoonish and super evil but again what normally would detract from the viewing experience enhances the joy tenfold. Especially when they are insulting the Chinese for being dogs or worse. They themselves are quite despicable. I mean child soldiers? Really? I doubt this is based on truth. Actually now I think about it a particular scene involving child soldiers is directly lifted from Good Morning Vietnam. In that film it made sense historic wise. In here it was to add to the threat and dread coming from these super villains. And yes, Dante Lam has been very effective incorporating such plot devices. Operation Mekong seems very similar to Extraordinary Mission which should not be surprising since it deals with the same topic. However I would say that Operation Mekong is far more kinetic and energetic. Not saying that it makes it a better film. More that you aren't given a chance to think about what really is transpiring in the film. While not that deep itself Extraordinary Mission does give more food for thought than Dante Lam's take on the Golden Triangle drug trade. But we will have to see which one holds up better in the long run. For now I would suggest to all the people who enjoy good action flicks to watch both of them. They are easily in the top tier of Asian action films. And I hope that the sequel to Operation Mekong (Operation Red Sea) will be just as good.